Some of you might remember the 1996 TV series in which Christopher Ecclestone plays Nicky Hutchinson. As an impatient politician he argues that “Tomorrow is too late”. The Northern Powerhouse Partnership (NPP) has today issued a report on education in the north of England that in some ways makes this point, especially in relation to pupils from disadvantaged backgrounds. 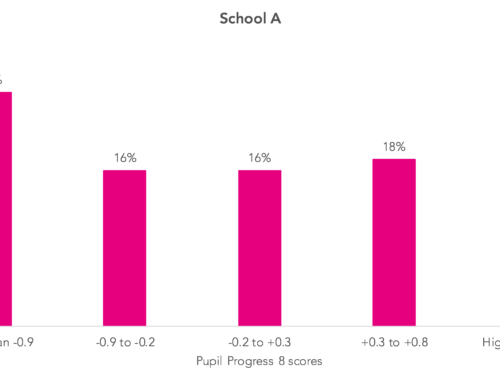 overall these long-term disadvantaged pupils make much lower progress than others – but there are a small number of schools doing well with these pupils. We also suggested that funding for Pupil Premium could be improved by targeting more support to schools who have a high proportion of long-term disadvantaged pupils. This proposal is one of the recommendations made in the NPP report. In other sections of the NPP report there are references to the success of schools in the south – particularly London – with disadvantaged pupils. Whilst this is true if we look at all pupils, there are differences if look in more detail at variations between different ethnicity groupings. Looking at the same data used in our earlier blogposts (three years from 2014 to 2016) we find that the Progress 8 score for long-term disadvantaged pupils varies between white and minority ethnic pupils. If we look at regions then it’s clear that London is doing well with their long-term disadvantaged pupils. But what if we look at white pupils only? And what about minority ethnic long-term disadvantaged pupils? This analysis suggests that lessons from London might provide valuable insights to other regions in terms of the progress made by minority ethnic pupils. 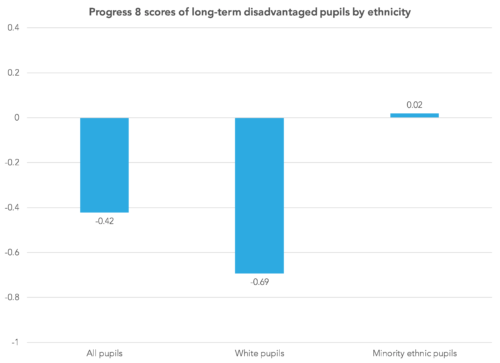 For white pupils, however, the conclusion is the same as that which Dave Thomson noted in an earlier post of his – that the attainment of disadvantaged pupils, particularly those from a white British background, is a systemic problem not a geographical one. Simon Burgess has also shown that white British pupils in London make similar progress to white British pupils [PDF] in the rest of England, taking account of neighbourhood disadvantage. So, is tomorrow too late? Whilst other strategies are needed for those long-term disadvantaged pupils who have now left schools, we can do something for those currently in schools. A small number of schools – we looked at case studies for Pipworth Primary and Sheffield Park Academy – are helping disadvantaged pupils to make very good progress. Interestingly, both of these schools are in Sheffield, so within the Northern Powerhouse area! As suggested in the NPP report, helping schools to collaborate and to spread effective approaches must be the way forward. Much of London’s success has been linked to initiatives for groups of schools in the London Challenge initiative. Tools which enable schools to share and compare, particularly at the level of individual subjects in secondary schools (e.g. FFT Collaborate) could provide the basis for such work. Next, read Mike’s reflections on the reporting of positive versus negative stories in education. We should cose or significantly reduce Ofsted and put the money into school collaboration.